Working Party: The first working party of the year met today. This was scheduled for last week but postponed due to poor weather. Today the weather was spring-like and much better. There was a reasonable turn out and a start was made beginning with the Blue & White Garden and the Queens wood. It was noted that the bluebells planted there last autumn seem to be thriving and we can expect a spectacular display soon. 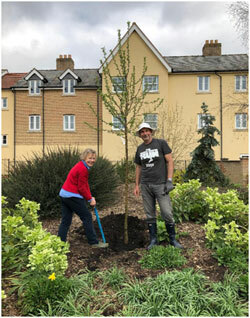 Following the vandalism last Friday and the destruction of the young apple tree the Friends purchased a tree to replace this and also a tree to replace the “wedding cake tree” which was not thriving. The new specimen looks much healthier. The old tree will be replanted elsewhere. The next Working Party will be on Thursday April 11th. 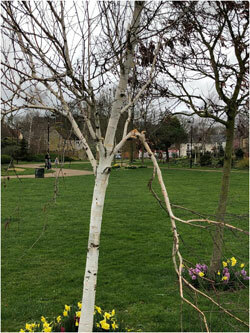 Membership subscriptions: Most Friends of Jubilee Gardens subscriptions are now due. 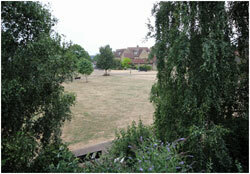 To renew or become a new Friend of Jubilee Garden please contact the Membership Secretary. Many have already done so and some local businesses have also become “Corporate Members”. These include PlanSurv, Neaves & Neat, Etheldreda Flora and Ely Rotary Club. Annual General Meeting: This will take place on Tuesday 26th March at 7.00pm. The venue is St Peter’s Church Hall, Broad Street. Hopefully all will have received an agenda by now. 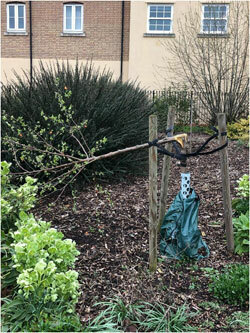 Damage to Trees: Unfortunately several trees in the gardens were damaged last night (Friday 15th March), not by the high winds but by a large group of young people around 11.00pm. Police were called but arrived just after the vandals moved on. 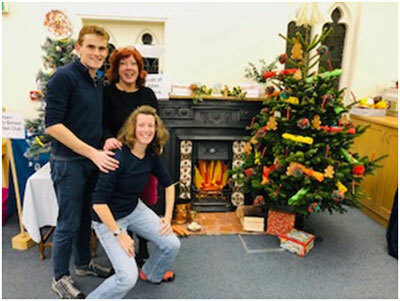 In recent years the Friends of Jubilee gardens has had an entry into the Christmas Tree Festival held annually in the Ely Methodist Church and this year Sarah Canham took over responsibility for obtaining and decorating a tree on behalf of the Friends. Visitors to the festival are invited to vote for the entry they consider to be the best. The Christmas Tree Festival takes place this weekend and is open to the general public on Saturday 1st and Sunday 2nd December. There have been many contributions from a number of local organisations. Our vintage themed exhibit with its Nordman Fir Christmas tree and fireplace was inspired by the medieval history of the site and the nature of the different spaces within Jubilee Gardens. The exhibit overall with its vibrant colour, textures and the strong smell of the gingerbread reflects the sensory garden. The wood on the hearth reflects the wood yard that stood for many years on the site and also “The Queen’s wood” an inspiration of the Friends in 2016 to celebrate the Queen’s 90th birthday. The blue and white items of the exhibit comes reflects the blue and white garden which is situated at the upper end (Broad Street). Our vintage decorations have all been handmade or contributed by our members. We hope you like our exhibit and continue to enjoy the gardens for many years. The tree has been decorated with hand-made crackers, hand-made paper decorations, vintage candle holders and genuine ginger bread men and Christmas trees. Sarah made the gingerbread and members also made contributions which included the lone of a fireplace! Sadly, Santa Claus’s sherry was deemed unacceptable by the church and had to be substituted but Rudolf’s carrots survived. Our tree, and the many others on show, are worth visiting. Try and do so this weekend. Some of Saturday’s crew hard at work in the Queen’s Wood. There were two “working parties” this past week. On Thursday the Winter Garden was given a thorough weeding and tidying up. It now looks so much better than it did. The working party was well attended with around 8 or 10 volunteers. After three hours of hard work we repaired to the Maltings for a well earned cup of tea. On Saturday an extra working party was organised to give Friends who find the midweek days difficult an opportunity to participate. In the event the working party was again well attended and we planted 180 cyclamens both autumn and spring flowering. In addition 5000 bluebell bulbs were planted and a number of snowdrops too. All of these in the Queen’s Wood, where hopefully there will be a spectacular display come spring. For now the autumn flowering cyclamens provide a welcome autumn splash of colour. A committee meeting was held on Tuesday 11th September and among other things it was decided that the next AGM would take place on Tuesday 19th March 2019. Members will be circulated and reminded nearer the time. There was a members’ working party in the garden on Thursday last and although they did a lot there is still plenty to do. 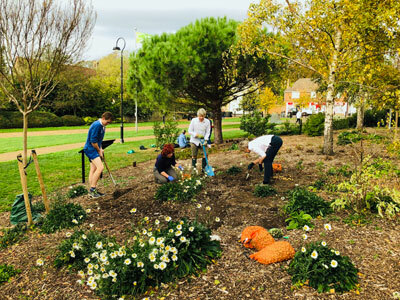 The next working party will be on Thursday 11th October at 09.30. In addition an extra working party is planned for Saturday 13th October at 10.00 and hopefully Friends who cannot make it on Thursdays will be able to come. If this proves a popular idea we could consider repeating it in future. The Friends of Jubilee Gardens have ordered some tulips, bluebells and cyclamen and will be planting these on the Saturday. Tea and cake have been arranged after both the Thursday and Saturday working parties at the Maltings. At the meeting on 11th September we welcomed two new “ordinary” members to the committee, Rachel Ingham and Niall O’Briain. 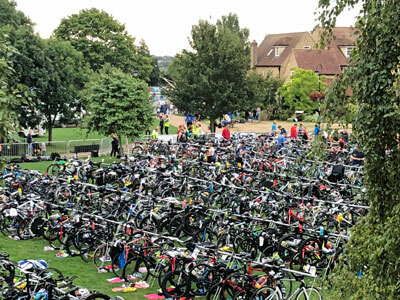 The Monster Racing Ely Triathlon was headquartered in Jubilee Gardens. Conditions were dry and fairly cool which will have satisfied the multitude of athletes who competed in the events. The first Pride event was held on Jubilee Gardens. The weather was good and attendance appeared to be also. It is the first time this festival has taken place here and hopefully it will become another Ely annual event. 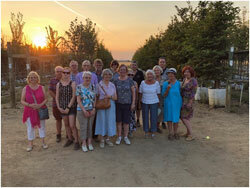 Yesterday evening a group Friends and friends of Friends enjoyed a guided tour of Barcham Trees. 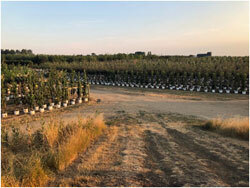 Barcham Trees is one of the largest tree nurseries in the UK, offering around 450 different species of tree for sale and having around 110,000 trees on their site at Barcham between Ely and Soham. The company employs 45 permanent staff and about 25 people on a seasonal basis. The tour was led by Clyde who is an experienced member of staff specialising in sales. We learned that all the trees on site are potted and we were shown the large machine that did the potting. Following this we were shown where the various composts used in the potting were put together. We then moved on to see how the trees were arranged in rows according to species and date of planting. We were shown how the irrigation system worked and visited one of the five pumping stations and also the large on-site reservoir. Throughout the tour Clyde was able to answer our questions which ranged from questions about the various species of trees to measures and policies to control disease and also questions about Barcham’s commercial operation. At the end of the tour there was a sociable buffet supper. Thanks are due to Judith Lockyear for arranging the tour with Barcham’s and to Clyde for his time and imparting his knowledge. Following Ann Laird’s departure from the Committee after five years I’m pleased to announce that Judith Lockyear has stepped into this role. The committee is short of two or three “ordinary” members so if you or anyone you know would be interested in serving on the committee please get in touch with me or any committee member for further information. 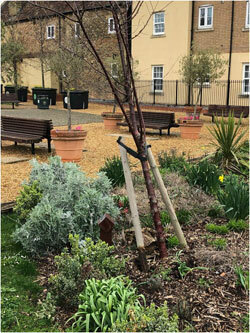 The committee meets quarterly in order to further the aims of Friends of Jubilee Gardens and would welcome fresh input of ideas and suggestions as to how the aims can be met and the gardens flourish. I am sorry to have to announce that Membership Secretary Ann Laird has resigned her role with immediate effect. Ann has served on the committee for five years and has other interests she wishes to pursue. I am sure the Committee and members will all want to join me in thanking her for her contribution over the years and wishing her well for the future. 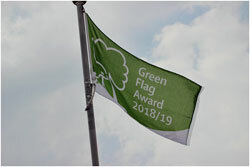 As members will know, the gardens were inspected in June for the Green Flag Award 2018-19 and I am pleased to announce that the 2018-19 Green Flag is now flying over the gardens. Thanks are due to the gardeners, Alli and Matt and to all of the friends to helped in the “working parties” for all their hard work. As yet I haven’t seen any comments provided by the inspector but hope to do so soon. At the time of writing the gardens have seen no rain for a month and the grass is looking very parched particularly on the right as you walk down to the river. Recovery is going to be slow. 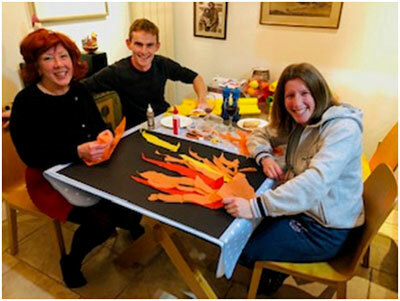 Welcome to the new Friends of Jubilee Gardens website, www.jubileegardensely.org.uk . Note the new web address. The previous website got a little out of date and I will try and keep this one more current and relevant. 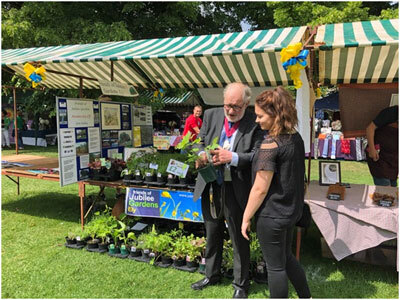 So far this year the Gardens has hosted the Eel Day Festival and part of Aquafest both were great successes thanks to beautiful weather. 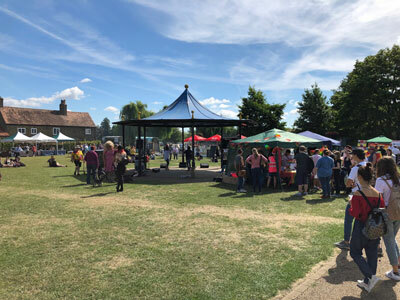 The weekly summer band concerts are ongoing (see the link for info) and also still to come is the Monster Racing Triathlon (Sunday 19th August) which helps put Ely on the sporting map. 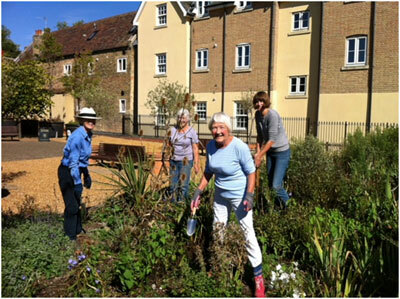 The Friends of Jubilee Gardens have been active in fund raising. On 2nd of June we ran a stall as part of the Etheldreda Fair on Palace Green. We sold a selection of plants and raised a goodly amount of Money. On July 14th there was a summer tea party hosted by Jane Blanchard. Again the weather cooperated and it was very successful. It was well attended and many members worked hard to provide food and drink. Again we raised a significant amount of money all of which will go toward the continued maintenance and development of the gardens. Still to come on Thursday 26th July is a visit to Barcham Trees which is situated between Ely and Soham. They are a leading supplier of large trees and the evening should be extremely interesting. It’s not too late to add your name to the list of attendees. The cost is £8.00 per person which includes a buffet. Judith Lockyear has made the arrangements. Contact us if you would like to go.